After avoiding the subject for way too long, I’ve signed up for French driving lessons. Unless your American license was issued in one of the 13 states (see below) that have a reciprocity agreement with France, you have to take both the written and driving tests once you live here permanently. That means drivers’ ed all over again. Technically, one could sign up on their own for these two tests, but the catch is that you must have a car equipped with brakes on the left and right sides. On your own, you also have to register for the exams through the Préfecture– a process that seems quite daunting to me. The only real solution for those of us from the “other 37 states” is to go through a driving school. 1. The school takes care of the registration at the Préfecture. 2. You learn what is expected of you on the exams. 3. You learn all sorts of French vocabulary you’ll never learn in college (i.e. point mort = neutral, angle mort = blind spot). And, yes, all the references to death (mort) do freak me out a bit. 1. Expensive (at least 1,000 euros for the classes and exams). 2. Time-consuming (you actually have to study, even if you already “know” how to drive). The whole process takes several months. 3. Apparently, less than 60% of the candidates get their license on the first try (and in Paris, you may have to wait up to six months for another exam date!). See why I’ve put it off for so long? Short-term visitors and students in France can both drive on their American licenses- no problem. Foreign residents can drive on theirs for up to one year. For those who have the right to exchange their license, they must do it in these first twelve months- otherwise, all is lost and they have to take the lessons and tests. To date, these states are part of the agreement: Arkansas, Connecticut, Delaware, Florida, Illinois, Kansas, Kentucky, Michigan, New Hampshire, Ohio, Pennsylvania, South Carolina, Virginia. *I chose a school with the best value for the money. For example, they propose unlimited classroom courses and three months access to their on-line lessons and practice tests (many schools didn’t offer this at all). I chose not to go with the most inexpensive schools, but a medium-priced and well-established one. Driving schools in Paris are more than abundant and the smaller ones frequently go out of business. I’m actually having fun studying, especially when I ask people who already have their license the mock questions and they don’t know the answers. It’s not their fault. It’s simply that the test is difficult and not always straight-forward. The way the questions are formulated can be tricky and you have to learn to think like the test (makes me feel like I’m taking the SATs all over again). I’m also having fun putting to work what I’m learning by walking around Paris, pretending I’m a police officer. I give imaginary tickets to, well, pretty much everyone. In order to give me test-studying energy, I started off the morning with some home-made muesli. 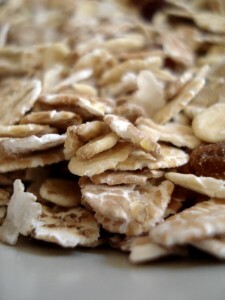 Originally from Switzerland, it’s made of uncooked cereals and is extremely easy to make. The advantage of making it yourself is that you can choose whatever ingredients you want- and you won’t get stuck picking out dried coconut shavings, for example. I used a combination of five different cereals in equal parts. If you don’t find them already toasted, you can do it yourself. Be careful not to leave them in the oven too long- otherwise they’ll become too crispy, like granola. Muesli should practically be raw. Toasting the nuts, like the cereals, brings out the flavor. I especially like adding slivered almonds. I grill them (without any oil) in a frying pan. Watch them very carefully, as they cook fast- I’ve burnt many a batch! Combine ingredients and you’re done. Top with sliced banana for extra fuel. This entry was posted in Everyday Life in Paris, Recipes (All), Recipes (Vegan) and tagged brunch, nuts. Bookmark the permalink.